Stephen Ministers bring distinctively Christian care to those in need. They use both words and deeds to express Christ’s care for others – listening and comforting, calling on the training they have received and employing the tools of faith. 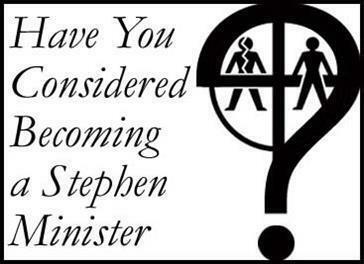 If this job description fits your personal goals for ministry, consider becoming a Stephen Minister. Please contact Ann Hatcher at 433-2251 for more information. Stephen Ministers care for people facing tough times. Are you facing a crisis or difficulty such as these? Please contact Ann Hatcher 433-2251 for more information.